Metropolitan Museum of Art. Used - Very Good. Great condition for a used book! Minimal wear. Metropolitan Museum of Art. Used - Good. Former Library book. Shows some signs of wear, and may have some markings on the inside. Yale University Press, 2004. Paperback. Good. Disclaimer:A copy that has been read, but remains in clean condition. All pages are intact, and the cover is intact. The spine may show signs of wear. Pages can include limited notes and highlighting, and the copy can include previous owner inscriptions. Metropolitan Museum of Art, 2004-02-09. Paperback. Good. Metropolitan Museum of Art, 2004. Paperback. Very Good. Unmarked. French flaps.The Metropolitan Museum of Art has long been renowned for its collection of American sculpture, in particular its world-famous American Neoclassical marbles. 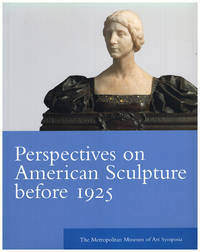 This volume contains eight papers presented at a symposium held at the Museum on October 26, 2001, upon the publication of American Sculpture in The Metropolitan Museum of Art. 160p. 120 illustrations, 2 in color. New Haven, Connecticut, U.S.A. & London, U.K.: Yale University Press, 2004. Softcover. Item remains in original shrinkwrapping and is unopened. AF. paperback. New/No Dust Jacket. Used. Metropolitan Museum of Art. PAPERBACK. 0300103204 Like New Condition. . Fine. Metropolitan Museum of Art, 2004-02-09. Paperback. Used:Good. Metropolitan Museum of Art. PAPERBACK. 0300103204 New Condition. . New.